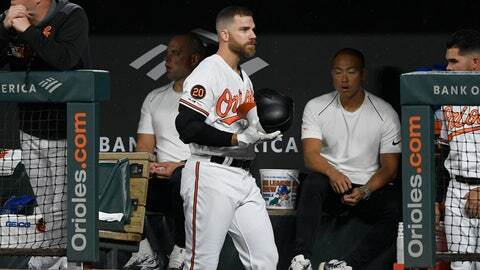 Davis went 0 for 5 to set the big league mark for the longest hitless streak by a position player, extending his drought to 49 consecutive at-bats in the Baltimore Orioles‘ 12-4 rout of the Oakland Athletics on Monday night. Vélez went hitless over his last nine at-bats of the 2010 season before going 0 for 37 in 2011, the last of his five major league seasons. His 0-for-46 skid eclipsed the previous longest hitless streak of 45, shared by Pittsburgh’s Bill Bergen (1909), Dave Campbell of San Diego and St. Louis (1973), and Milwaukee’s Craig Counsell (2011).